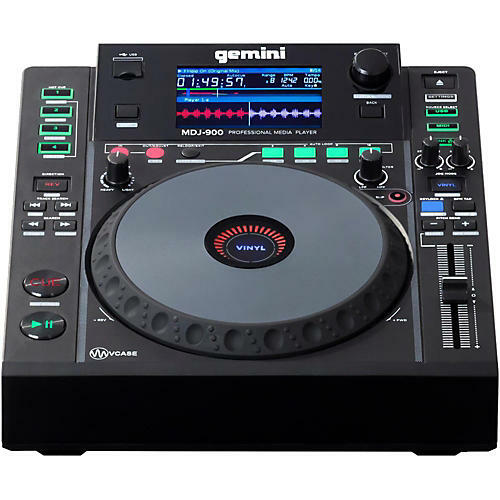 The MDJ-900 is aimed at the demanding professional DJ, boasting a large 8 in. touch-sensitive jog wheel and packed with tons of high-end features. This cutting-edge digital media player is all about ease-of-use, letting you mix effortlessly without the need for external software. Link mode lets you connect up to four separate players via Ethernet and share music from the same USB stick. Aside from making it easier to share your music library, link mode opens up a whole new world of possibilities. With multiple decks connected, enabling sync mode matches the tempos on each MDJ-900, freeing you up to experiment and create more complex mixes on the fly. At the focal point of the MDJ-900 is a large, 4.3 in. color screen that provides realtime visual feedback of your tracks. Full track information including title, time, BPM, and pitch are clearly displayed alongside the precise waveform window. Additional visual feedback for slip mode, hot cues and active loops mean you can confidently use scratches or hot cues without ruining your mix. The 100 mm pitch fader ranges pitch from 4%–100%, so you’ll mix with surgical precision. Thanks to the MDJ-900’s intuitive interface, you’ll spend less time deciphering and more time pushing the limits of your DJing with the 4 hot cues and 8 auto loops. The 8 in. capacitive jog wheel with LCD display offers adjustable resistance so you can dial in the feel that’s perfect for you. Bonus MIDI capabilities mean you can even control the parameters of your favorite DJ software directly from the unit, routing your audio through its 24-bit/192kHz soundcard. Built-in high- and low-pass filter gives you unique mixing possibilities not found on other products.